This post is of photos of drawloom or double harness weavings, all but two taken during the Sept. 17-21, 2012 Drawloom Basics class I attended at VavStuga. These photos are posted here with the knowledge and permission of VavStuga, and my thanks to them for sharing these and so many more examples with their students, and allowing me to share a few of them here. 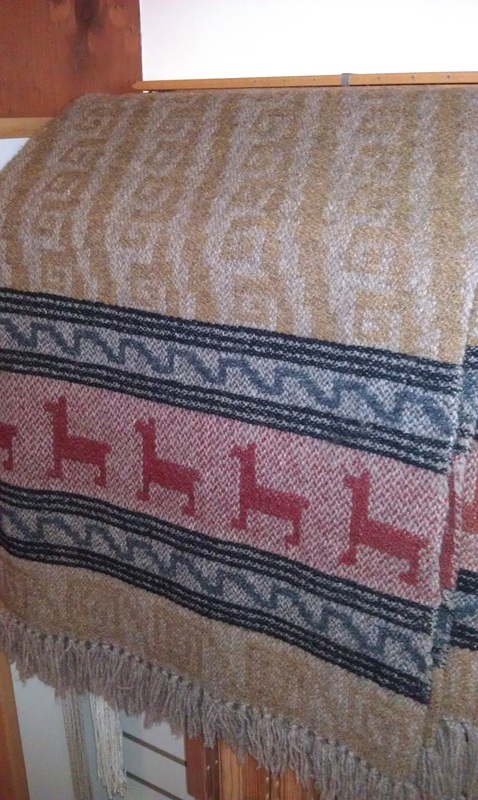 Smalandsvav coverlet with sheepskin backing, woven by Becky Ashenden. 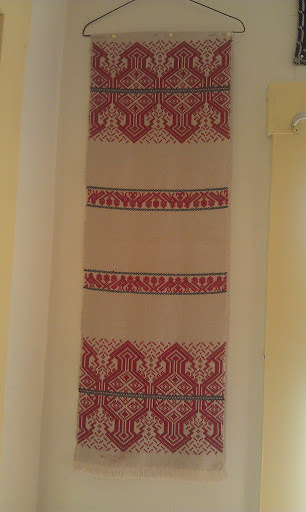 Becky’s coverlet, larger view (photo taken Nov. 2011). Smalandsvav coverlet, by Susan Z. Conover, quilted, with handwoven band trim. 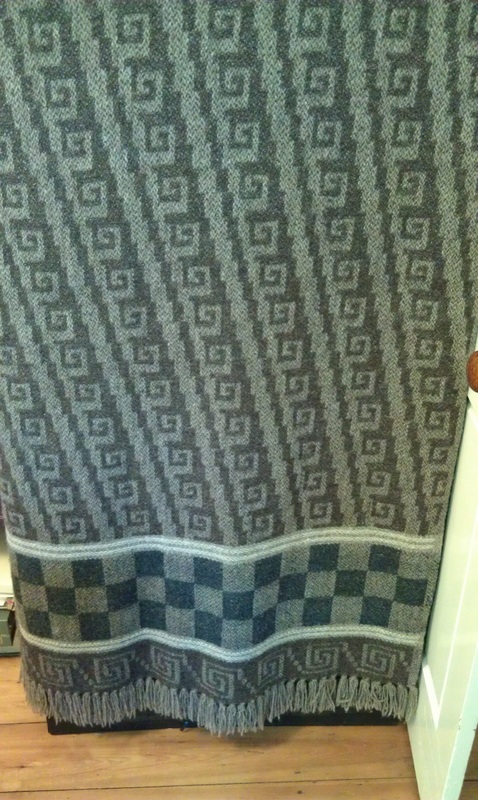 Smalandsvav coverlet by VavStuga apprentice Terry Slagel, Sept. 2012. 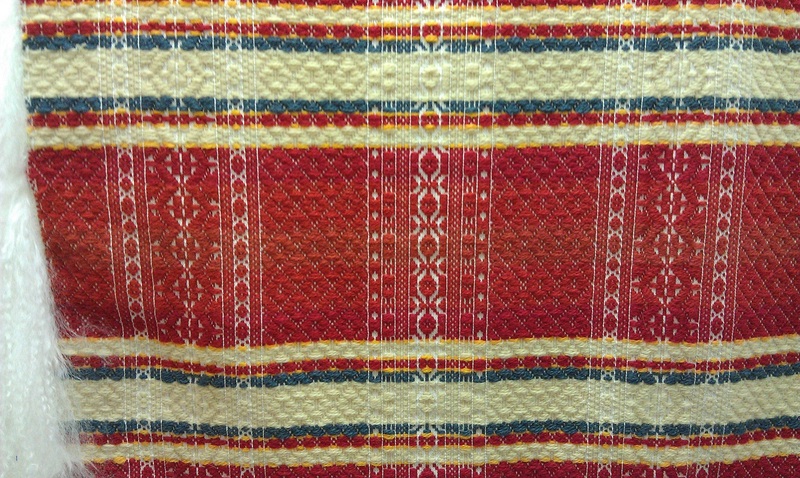 We were shown so many other examples of double harness weavings, and I wish I had photos of all of them. 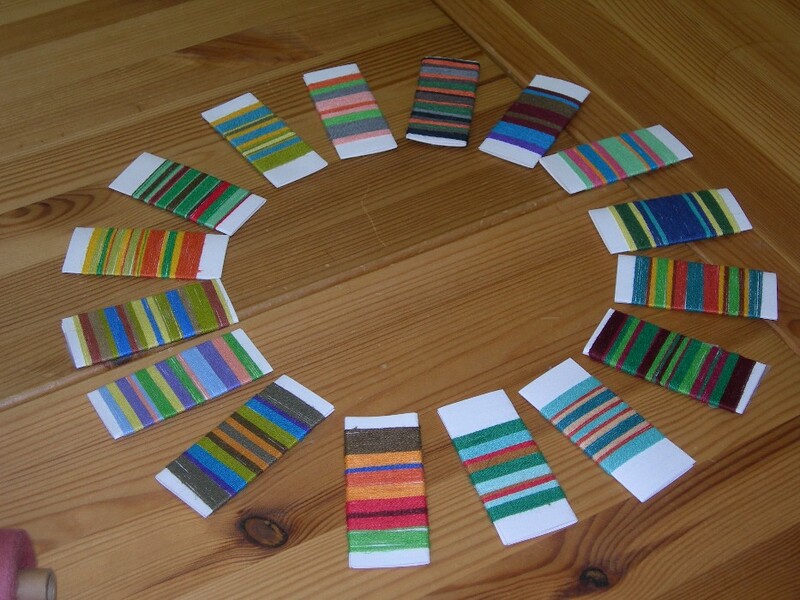 (Any errors in identifying the types of weaving shown here are mine.) So, now it’s time to learn more and begin weaving my own. 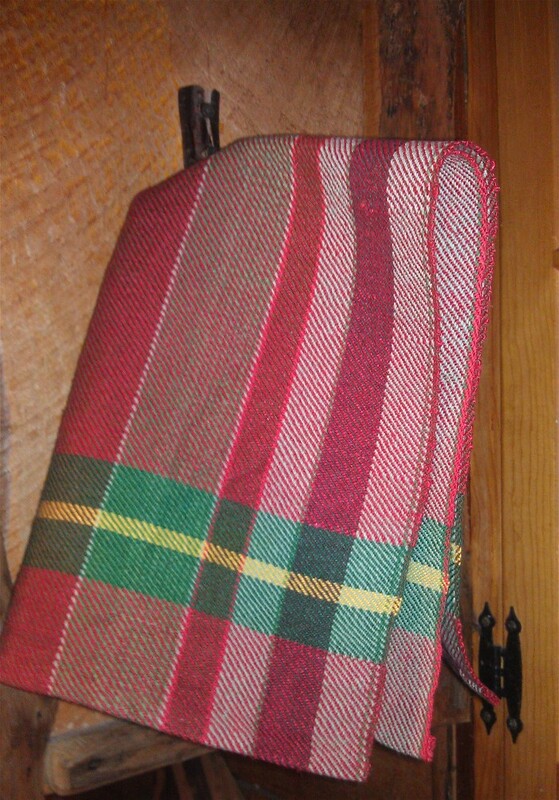 Wool blanket warp using Swedish Tuna wool, doubled. After the blanket warps were made and beamed, we could choose to weave on either the red or blue warp. As tempted as I was by the red, I chose the more calm, peaceful blue, shown above. 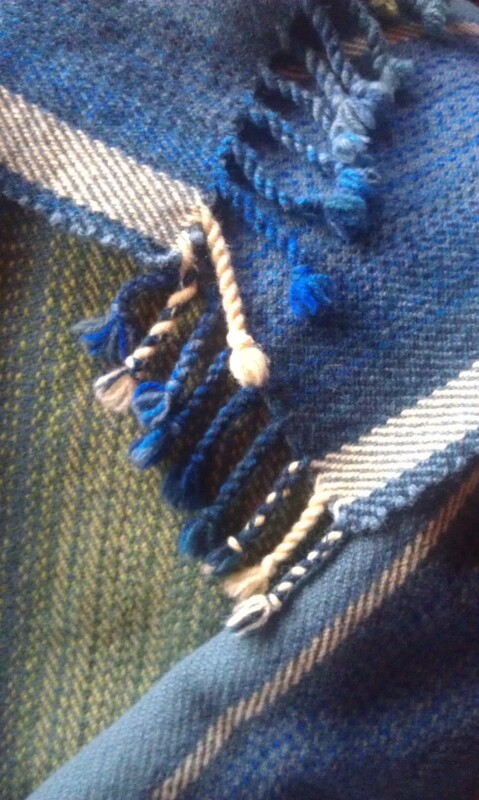 For weft I used a muted blue (see Part 1 for photo of blanket in progress). A bit closer, and showing fringe. ﻿We were shown how to twist and tie the fringe, and later than evening I stayed up quite late to finish the fringe on my blanket. The next day, fulling was done, by Becky, using a washer and dryer. I always say weaving should be used and not put away, and now that these photos are done, I will use mine. I had to wait, though, because if I had put this blanket down on my bed, I would never have gotten the cats off of it! 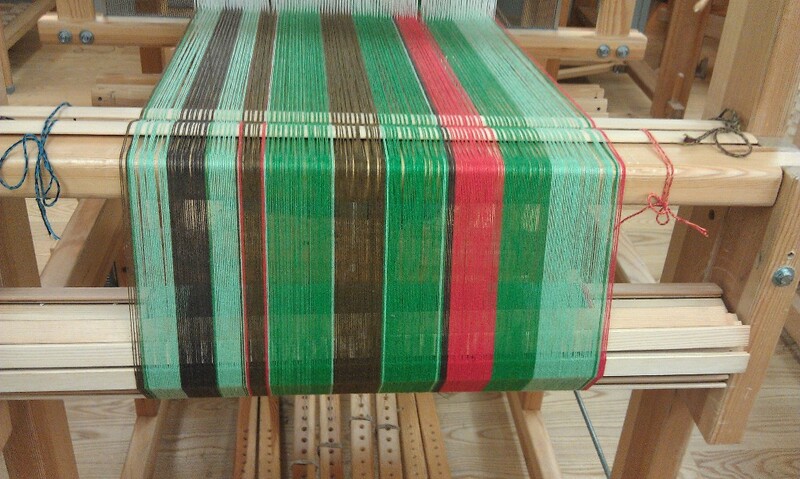 Weaving of two other students, using color for weft. 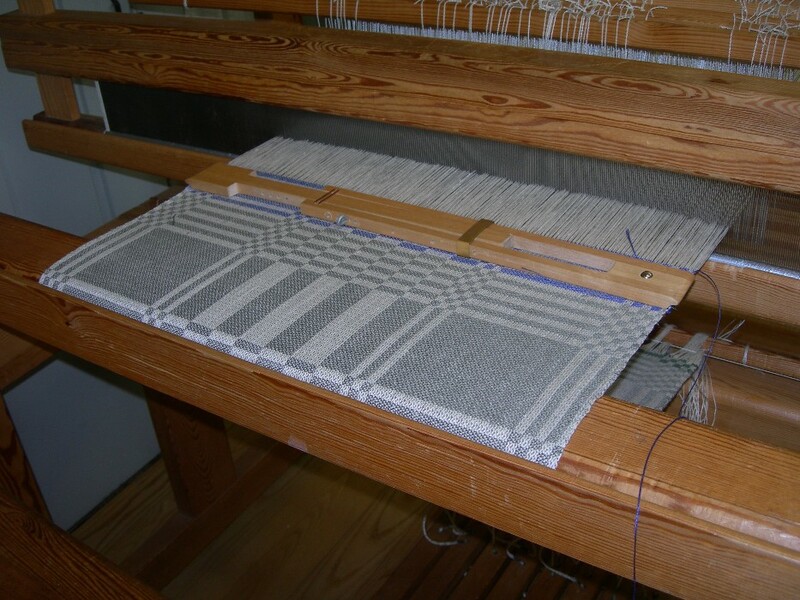 The next weaving I did was the two block, 8 shaft damask in broken twill, using single linen warp, 2 ply linen weft. Other students used contrasting colors (from the warp) for their squares. I decided to go for a more traditional look, almost tone on tone, so my weft choice was just a shade or two different from the warp. This also makes it more challenging to photograph, especially at night, using my phone, after dark! 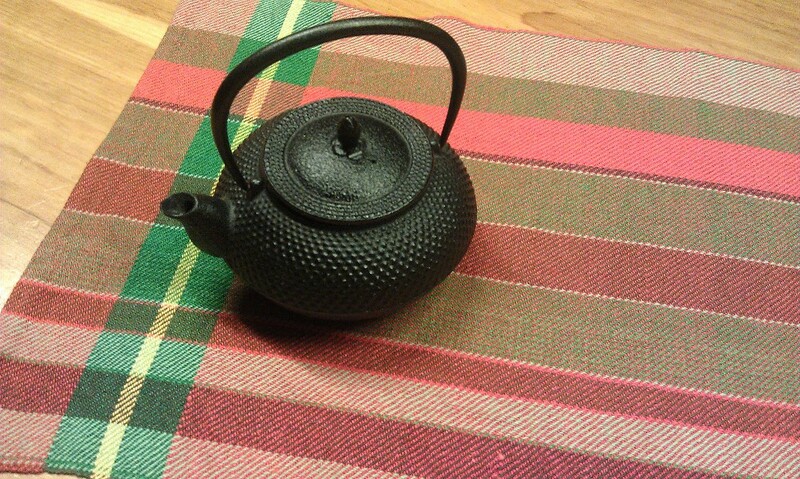 It definitely needs more spritzing and pressing, since it had thoroughly dried overnight near my woodstove. A cold mangle has become very high on my Wish List, or should that be Need List? My traditional look damask piece. Next came this cottolin towel warp, 4 shaft, straight twill threading. 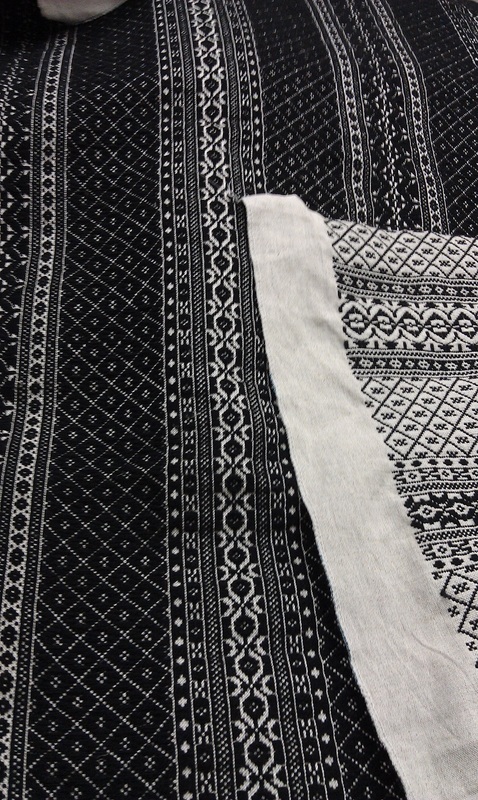 We used 8/1 tow linen for weft. 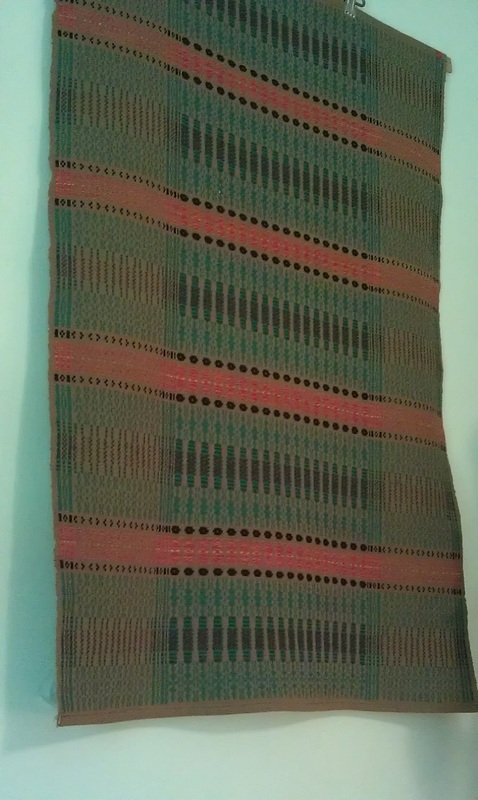 I liked the brighter green and red, it made me think of Christmas, so I wove it using a bright green tow linen, which highlighted the green (and red) in the border, and the other warp colors toned the green down a bit. 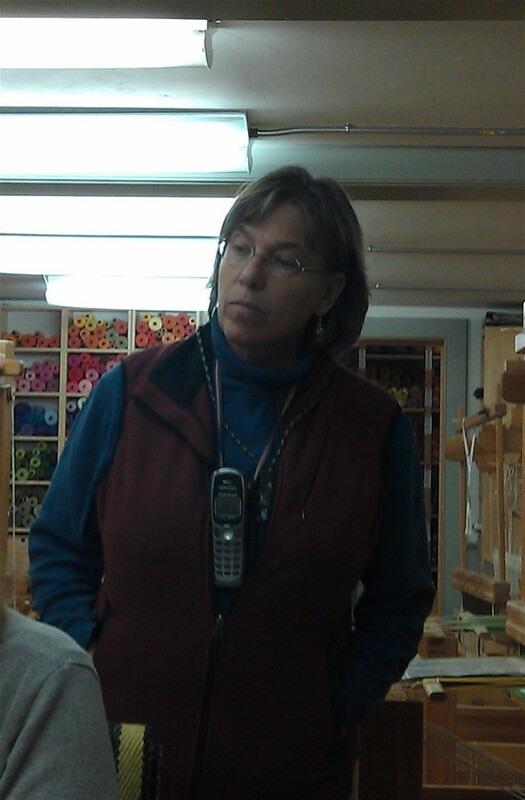 A new weaving friend in the class wove hers in bright red. 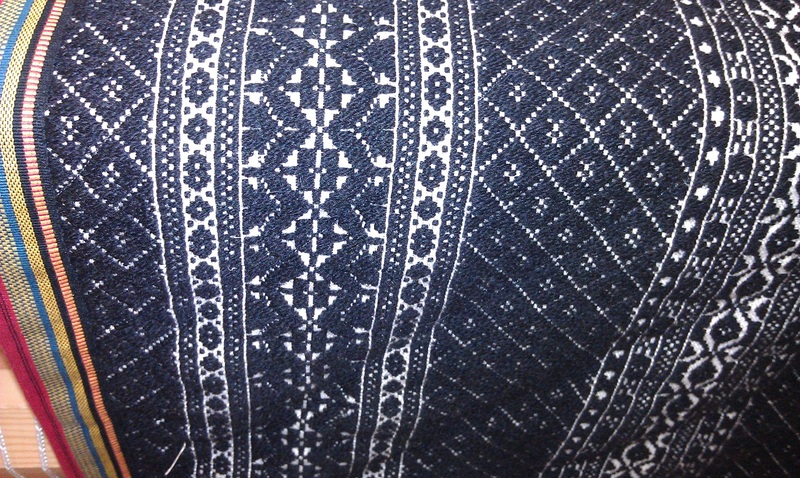 My Christmas towel (brighter in person than in this pic). Towel hanging just left of my kitchen sink. 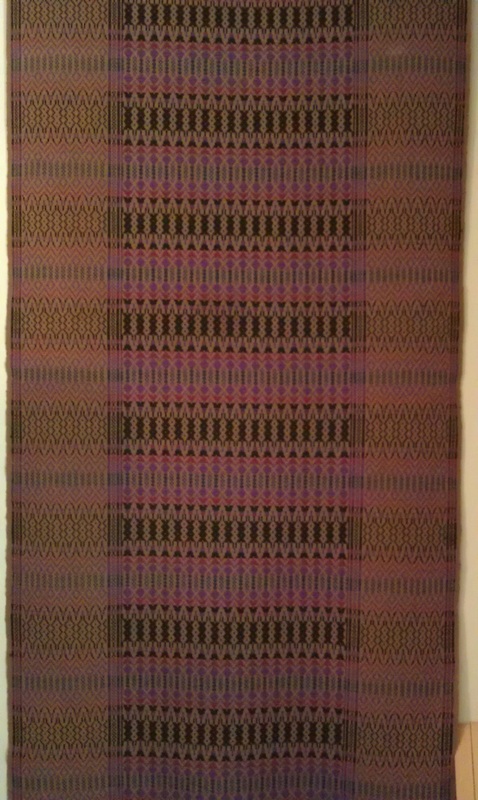 My last piece of weaving was this small tablecloth, 8/2 Bockens, both warp and weft. I was the last person to start weaving at the beginning of the week, so I was the last person weaving at the end of the week, as I had to wait for a loom to be free. Not to worry, this gave me a bit more time to browse through VavStuga’s amazing library. Finished small tablecloth, just fits the island in my kitchen! I started this piece at almost 11 AM and had been told shuttles would be put down at 3 PM whether we were finished or not. 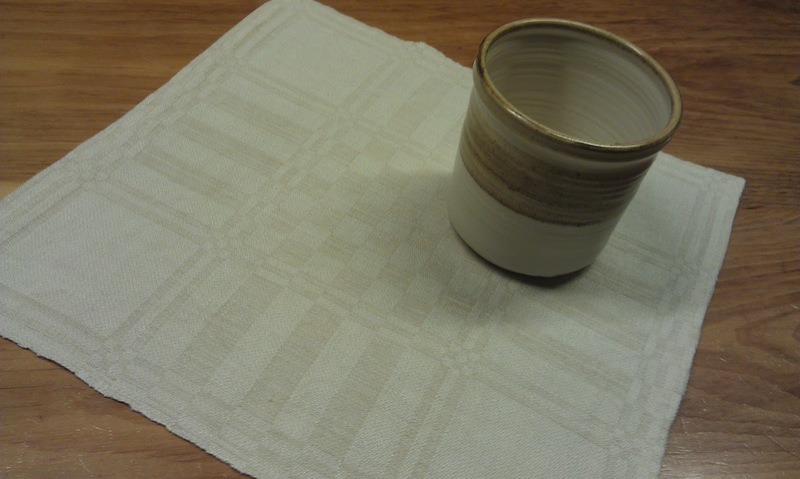 I really wanted a finished piece, not a sample, so likely wove faster than I ever had. I finished at 2:50 PM, ten minutes to spare, Whew!!! 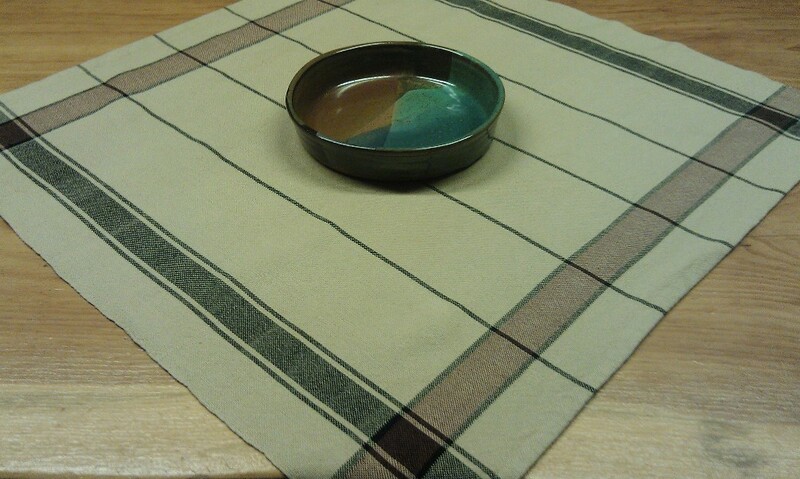 My pie plate, by potter Anne Appel, goes well with this cloth. I think this piece turned out very nicely, except in my haste to actually finish this piece before we had to stop weaving, I forgot to put the “light sections” in as in the warp. At home, if I make a mistake in warping or weaving, I always stop and fix it as I don’t want to look at my error forever. This day, though, I had a time crunch and decided to just go with what I’d done. 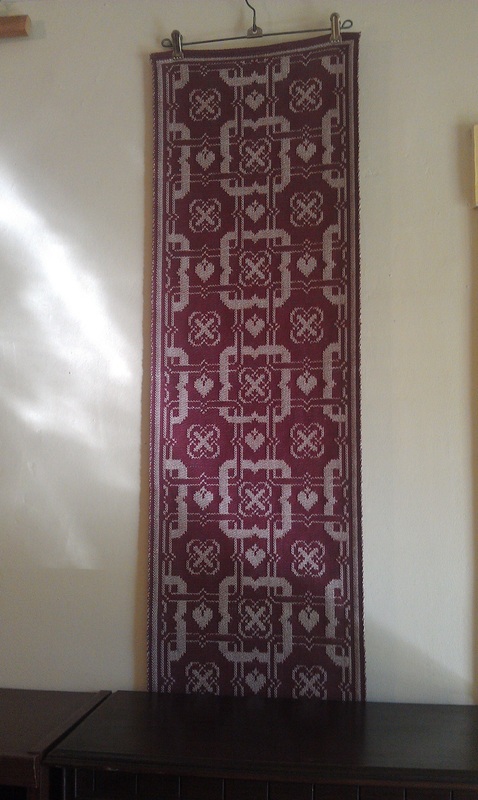 I had to laugh when I had woven several inches and then noticed it. 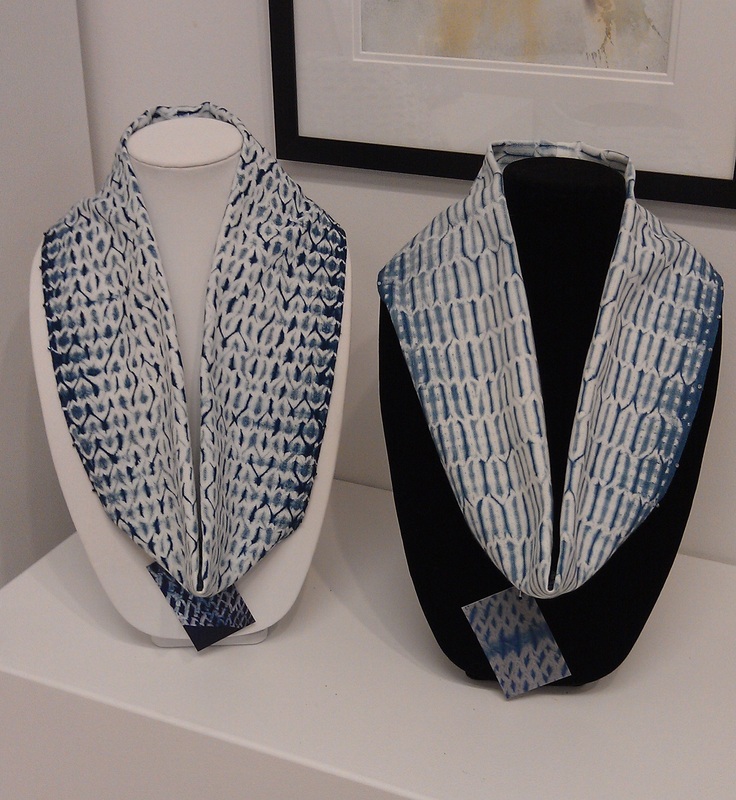 Becky walked over, I said, “I forgot…” She said, “I thought you did it on purpose!” Then I flashed back to the beginning of the week and talking about designing symetrical and asymetrical warps, laughed and said, “oh that’s right, I was tired of all that symetry!” (Not!) 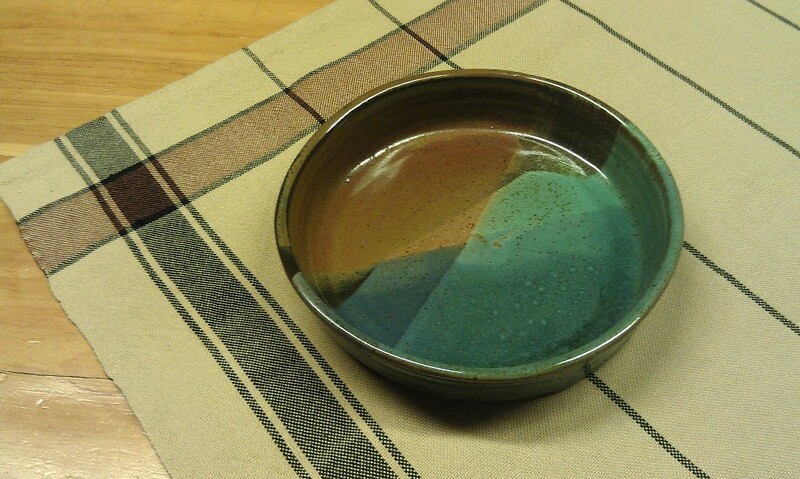 Every time I look at this piece, I recall my error, ut still, it’s nice as is, and I can always weave another. Meanwhile, I will enjoy this one! New weaving friend Diane, of St. Paul, MN. Myself, out on the warping porch. Flying home, I kept thinking what a great week I’d had. Two months have gone by and I still feel exactly the same way. I had heard from other students that things run on schedule, and they did. I don’t know how else you could get all of that in five days! 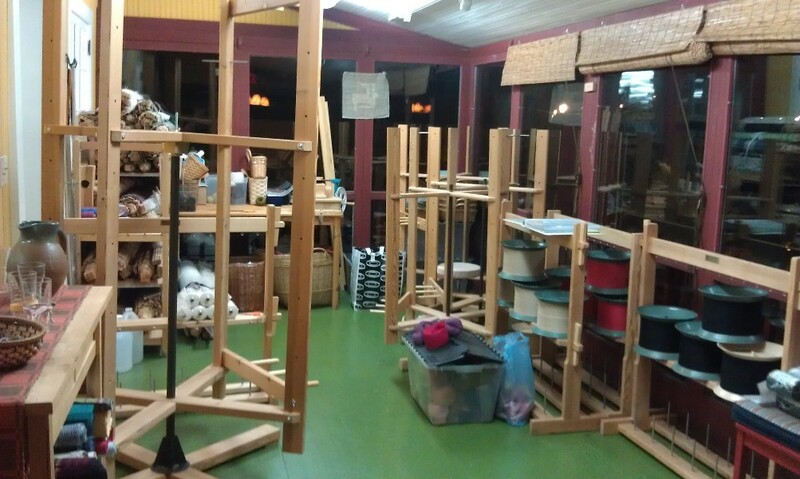 I’d heard (online) from at least four other weavers, and all said I would have a wonderful time there, and so I did. Becky is a wonderful instructor, very knowledgeable, clear explanations and demonstrations, and has more energy than anyone I’ve seen in a long, long time. 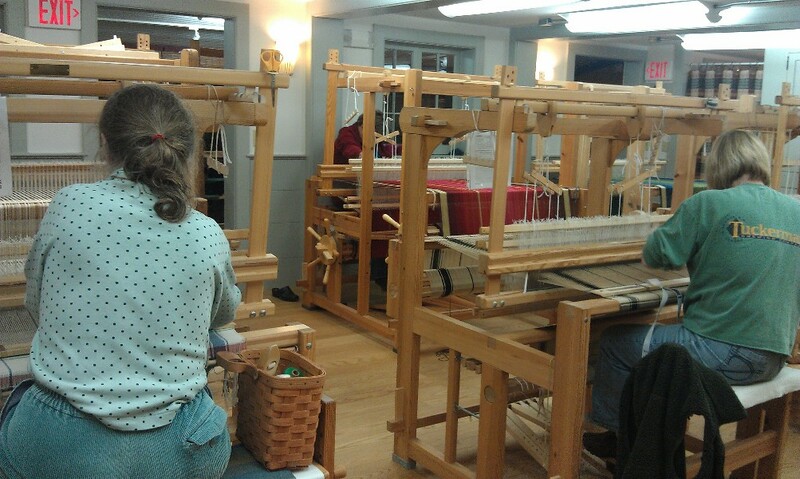 And, the handwovens she kept pulling out, whether for this class or future classes, are fascinating. 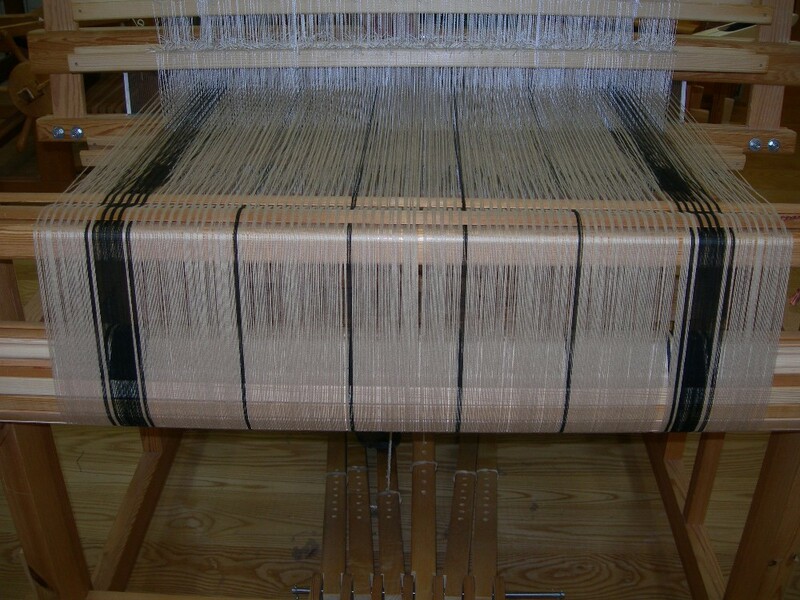 If you are interested in Scandinavian weaving, and traditional methods, this is a wonderful place to learn. Susan, who has a smile that lights up a room, is there keeping everything running smoothly, answers questions, and at the end of the week, takes care of your purchases, bills, and ships anything home you don’t take with you. Gentle Sara, apprentice at VavStuga, took care of our breakfast each morning, worked on her big loom, weaving wide lace curtains, and still had time to chat a bit or answer a question. 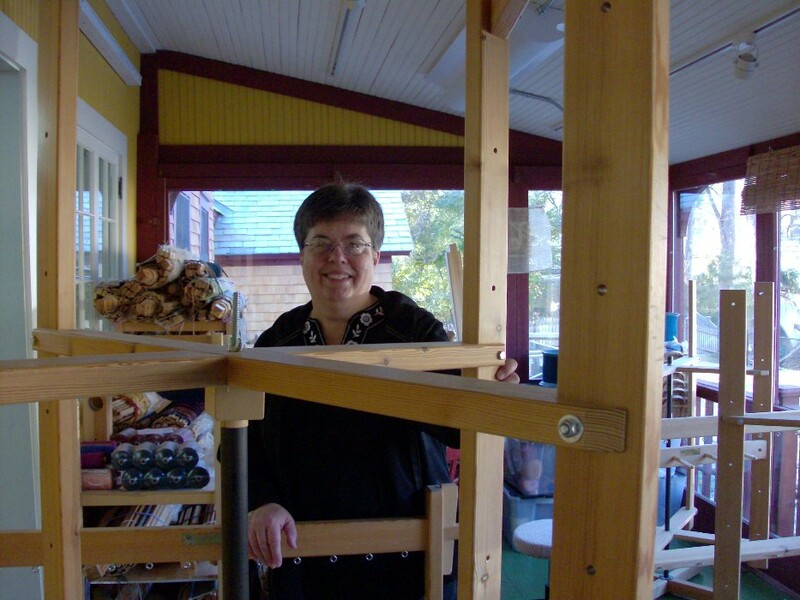 The loom/school space is wonderful, filled with countermarche and counterbalance looms, a great library, wonderful warping equipment, the shop is close by in another part of the building, and accommodations are upstairs. Lunch and dinner, served on the porch overlooking the river and scenic view, were delicious! At each meal, the table is set with completely new handwovens, amazing! And how I wish I’d kept my camera with me at all times. There was a lot of laughter and stories told over those meals. After lunch we would have 20 minutes or so to go for a quick walks and dash into local shops and galleries. We wove from 9 AM to 9 PM, with time out for lunch and dinner. After dinner, we would go back to our looms and weave until 9 PM. Then, running up to get a jacket, some of us would go out for a short walk, just to be outdoors for a bit, get a little exercise in, then go up for more chat, perhaps some knitting or weaving on a bandloom, then rest up for the next day. I have to add, the lighting in VavStuga class area is wonderful, something I need to have someday. I say “someday” because I will likely be moving at some point and will not be adding a lot of fluorescent light fixtures now in my weaving studio (what is really a good-size living room) wood ceiling! But that lighting is also on my Want/Need/Must Have List. I had a package sent home, with three new books, Becky’s “bead” tie-up system for my countermarche, five tubes of cotton, a threading hook and a band knife (both made locally), along with a few other bits & bobs. And, a bandloom was shipped to my home, something I had wanted for a good 16 years or more since seeing once in a Glimakra catalog and a photo of something similar in an early issue of VAV. 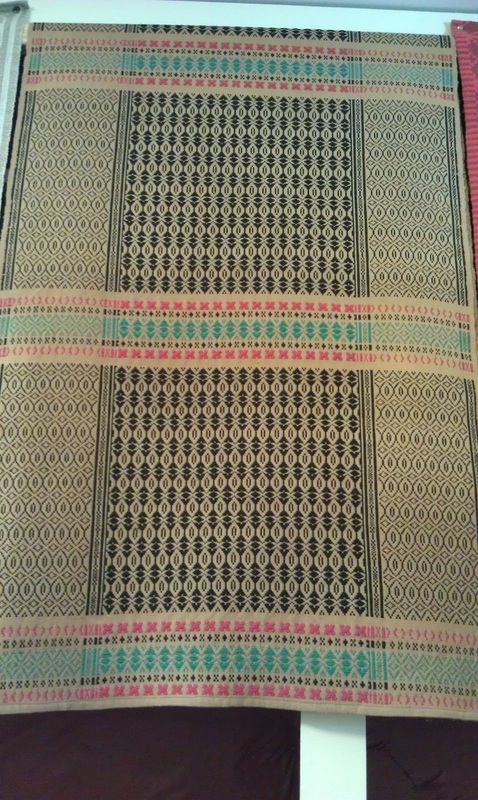 How nice to have been able to do a bit of weaving on one before making a purchase! The bandloom will likely be appearing soon on this blog. VavStuga can be a very dangerous place to someone, like myself, with no weaving shop within a couple hundred miles. All those handwoven curtains that week made me want to go home and weave curtains and valances for my windows, and of course, I’ll need tiebacks (bands!) for them. That’s my story, and I’m sticking with it! 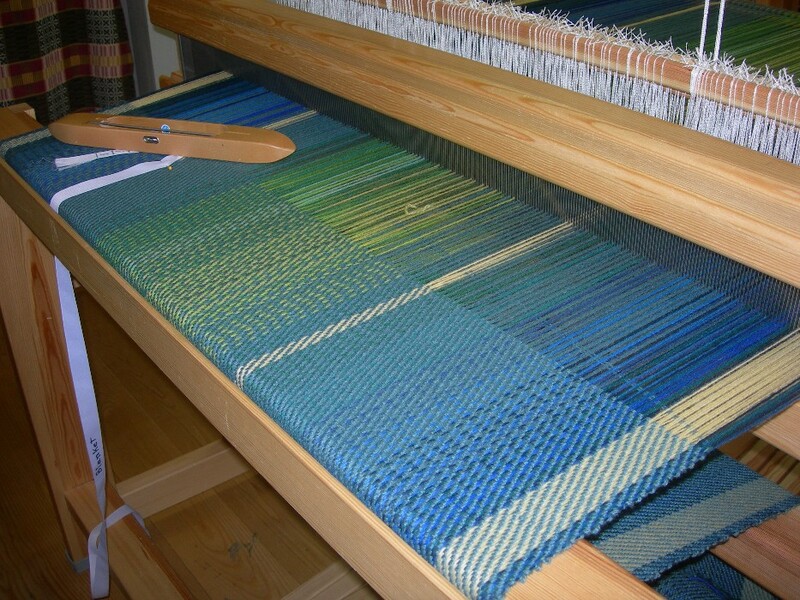 I am back weaving at home now, incorporating a lot of what I learned as it comes time to use it. 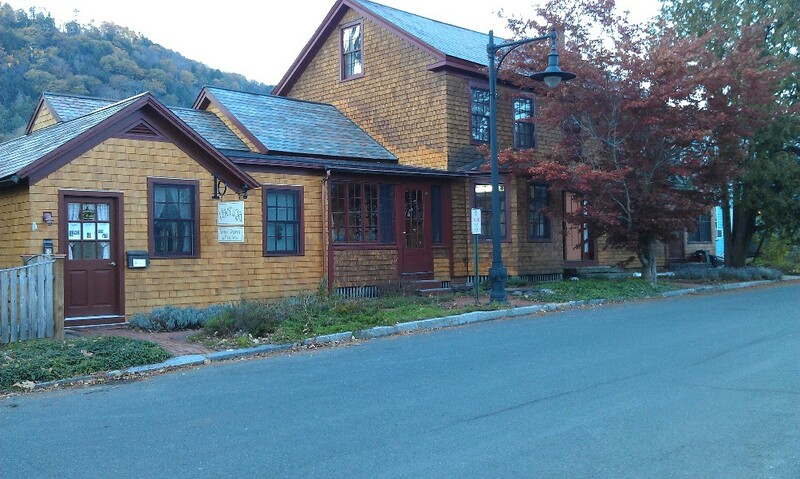 I am so looking forward to September when I will be back in Shelburne Falls, attending the Basic Drawloom class. 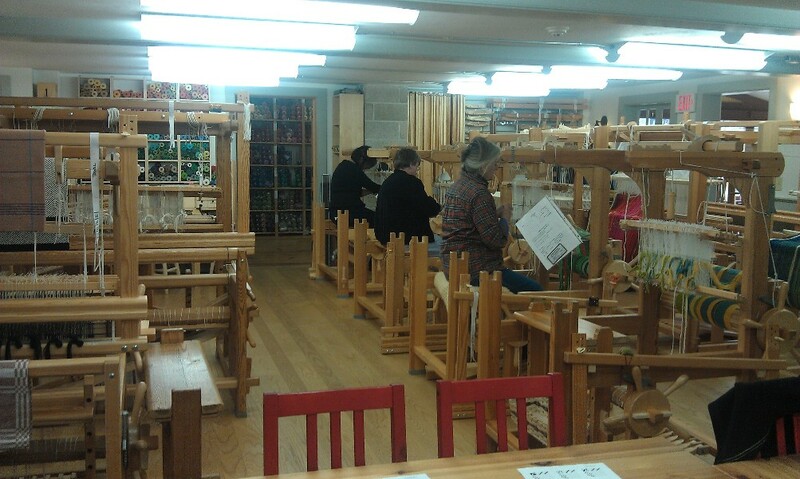 Meanwhile, I’ll be here, weaving and learning. VavStuga in Shelburne Falls, MA, Nov. 6-12, 2011. My journey to VavStuga began nearly a year ago. 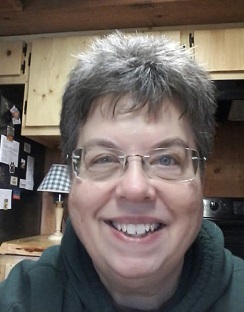 After 20 years of putting my life on hold for husband and children, I now had an empty nest and decided,… It Is My Turn! 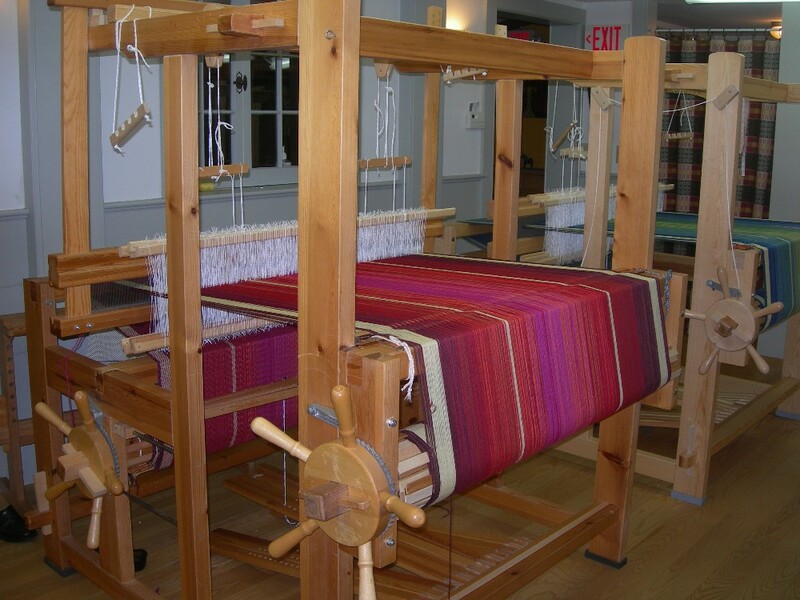 I would now focus on my weaving and fiber interests, and a very real need, hunger, to learn new methods and techniques. My paternal grandparents emigrated from Norway, so I have long been drawn to things Norwegian/Scandinavian, including weaving. 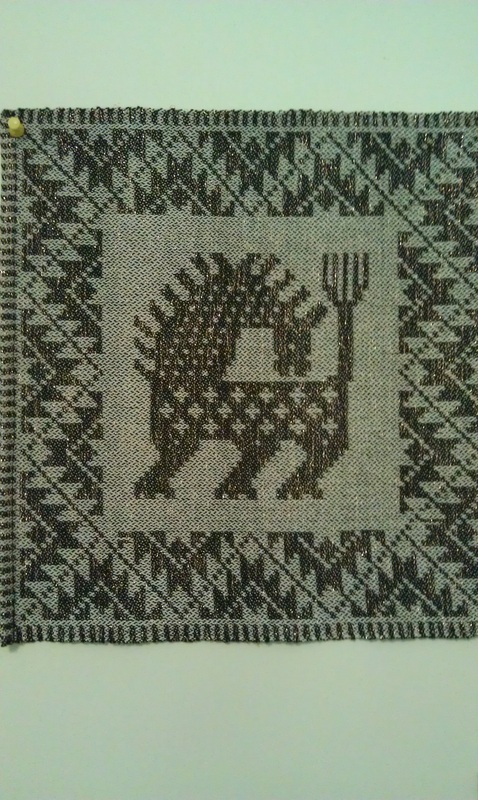 VAV Magazine had long been an inspiration as were my growing collection of Scandinavian weaving books. It seemed to me the best way to merge my weaving and the need to learn would be to take classes at VavStuga where traditional Swedish techniques are taught. So I called, paid my deposit, and waited nearly a year for this class. My dream was to take a drawloom class at VavStuga, but I found out that first I would need to take their “VavStuga Basics” class, required before taking most of their classes. That was fine, I had no doubt I would learn a lot, and so I did. The class was Nov. 7-11, 2011. 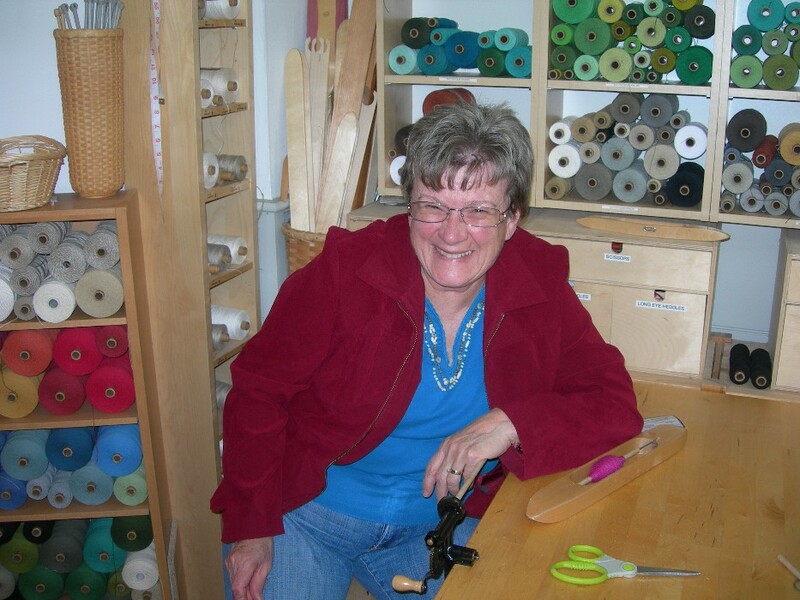 VavStuga classes are taught by Becky Ashenden, and Susan Conover, her business partner, keeps everything running smoothly. ﻿﻿Monday morning began with a table covered with dozens of tubes of cottolin, a rainbow of colors, and we were to experiment with color, stripes, symetrical and non-symetrical designs. 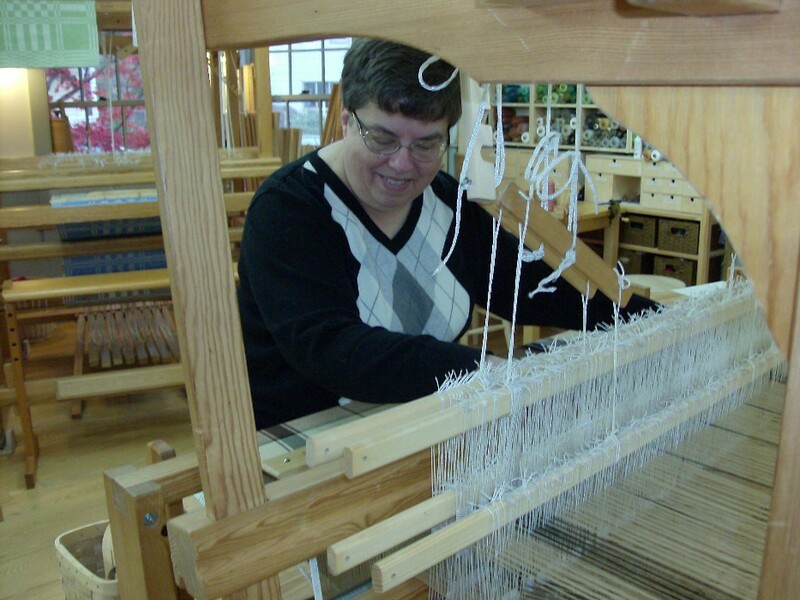 Two looms were warped up with the group favorites. After the “wraps,” we were off to the warping porch, with warping mills, cone/spool holders, large electric ball winder, and more. We took turns working on the blanket and towel warps. 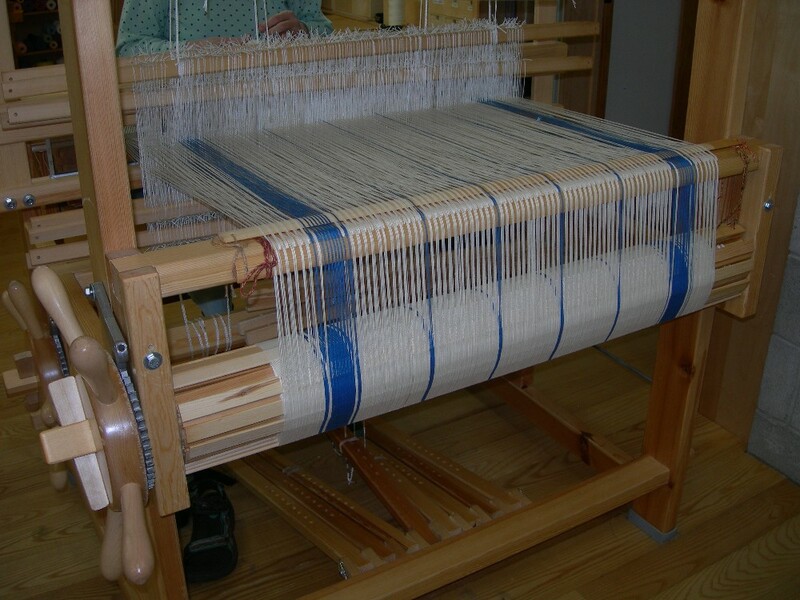 A blanket warp was used to demonstrate warping with a trapeze. With no extra hands at home to help warp looms, that is next on my “must have now” list. 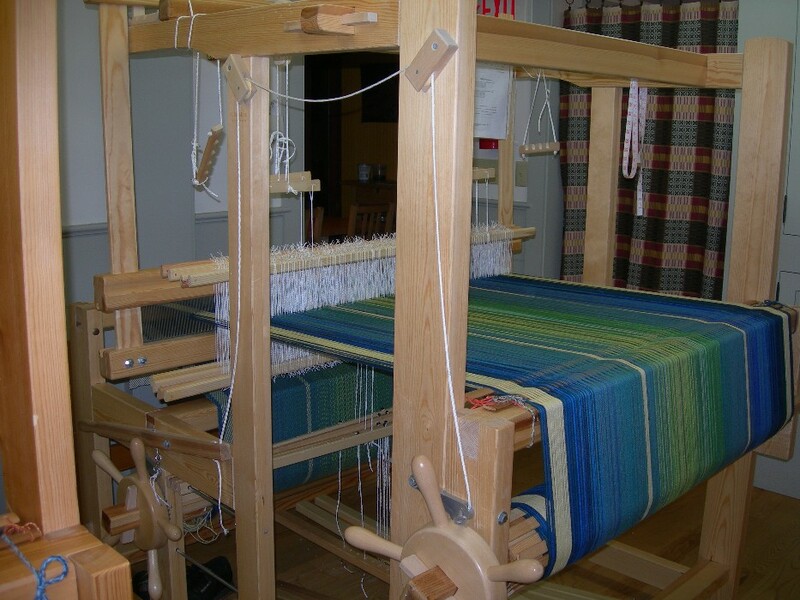 Wool blanket warps on two looms, threaded for twill. 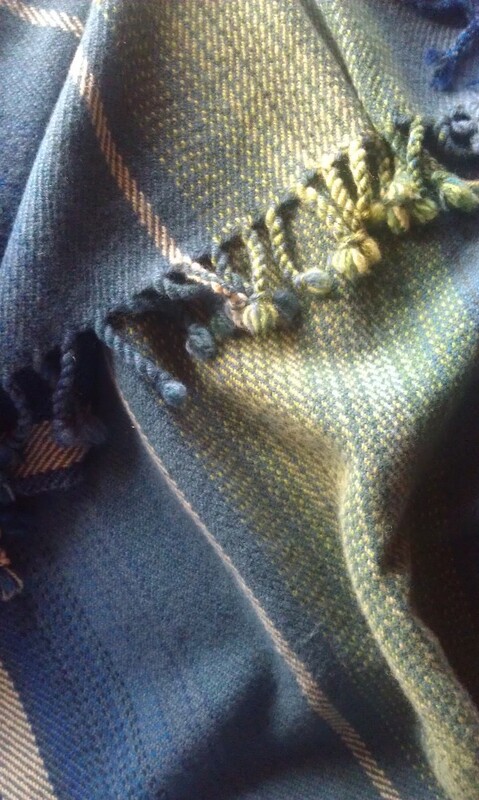 My first weaving at VavStuga was a blue & green blanket, also my first time weaving that wide with wool. 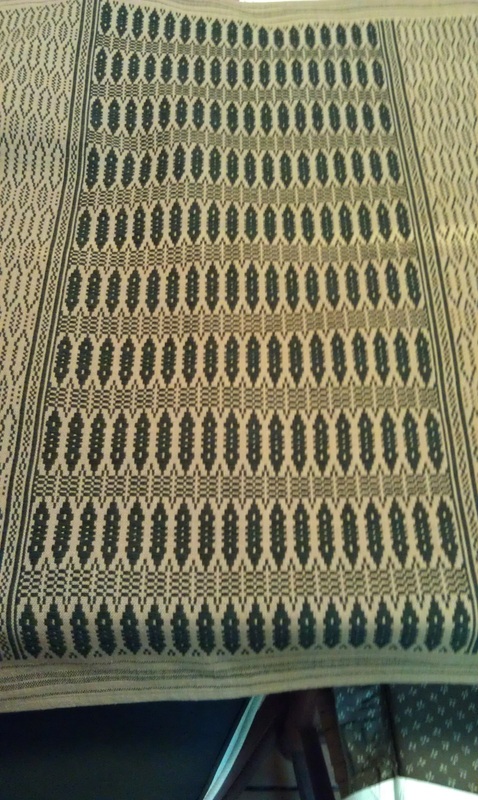 Tan and black cotton tablecloth warp. 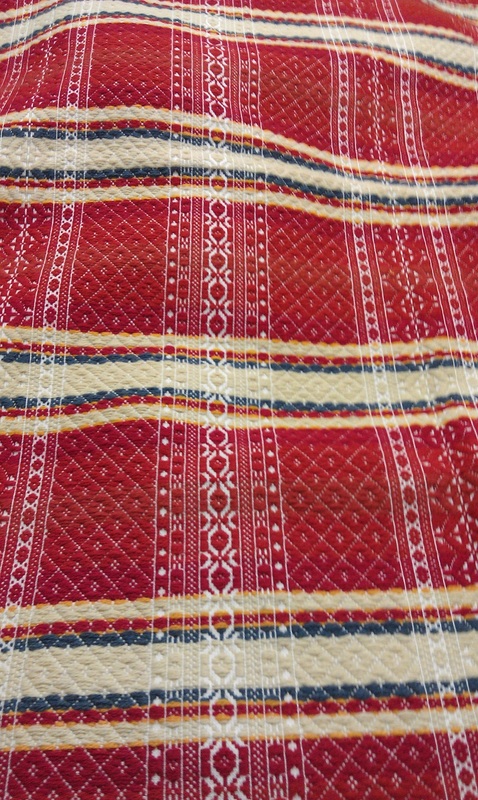 Blue and white cotton tablecloth warp. 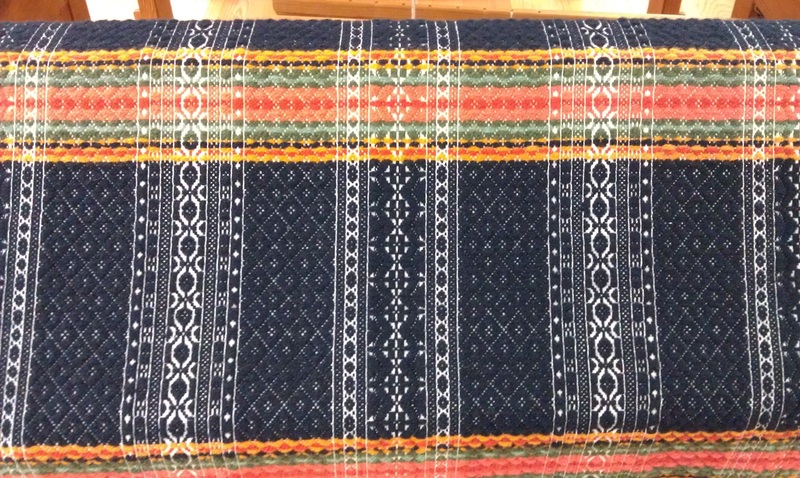 Weaving completed and off the looms. 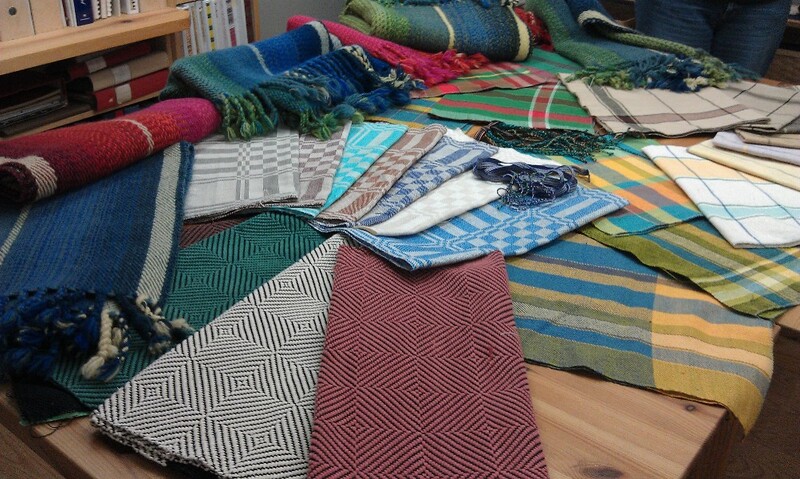 In one week, each student completed a blanket, a towel, a small tablecloth, and a two-block 8 shaft weave. If anyone had time and inclination, they could also weave a floor mat (bottom, center in pic above). I was the last to start weaving and the last to finish, completing my fourth piece 10 minutes before we were to put shuttles down. Whew! One evening we made braided fringe on our blankets, and the next day they were fulled. All other pieces were serged and brought home to finish hemming. Photos of my completed pieces will be in another post. 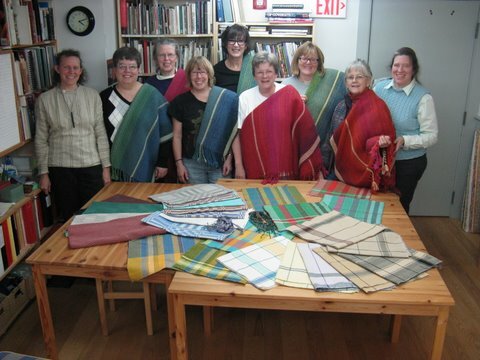 L to R: Becky, Janice, Maggie, Jody, Amanda, Diane, Nikki, Margo, and Sara (Becky’s apprentice). I wish I could say I have photos of every technique and new-to-me thing I learned that week, but I do not. Rather than be distracted by taking even more photos, I wanted to focus and hopefully be able to remember what I was seeing and doing when I returned home. Parts 2 and 3 will be up this week. A drawloom class? 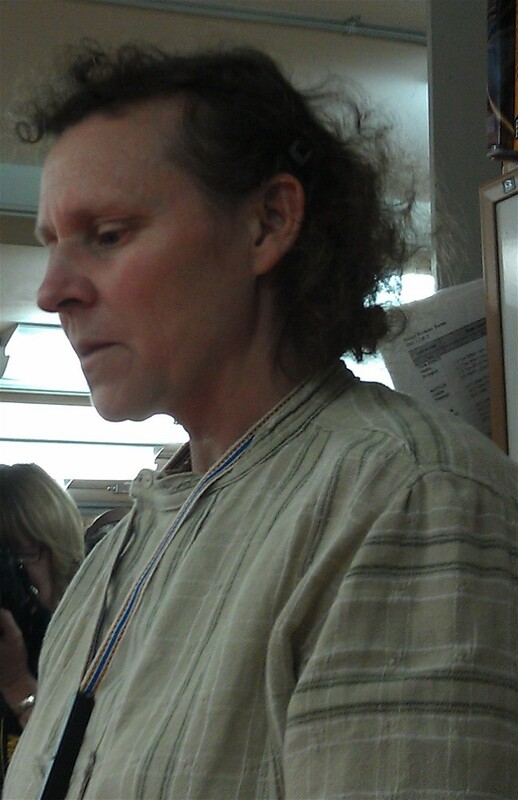 I will be back at VavStuga in 2012 for Basic Drawloom!